In New Hampshire and across the country, our brave men and women who served in uniform have faced unacceptable challenges in accessing the care and services they deserve. 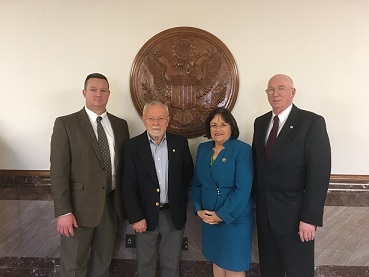 That’s why I was glad to hear from members of the American Legion and Disabled American Veterans (DAV) in Washington this week on how we can correct this issue and ensure no veterans in New Hampshire or the rest of the country have to jump through hurdles to receive the care they need. As the daughter and daughter-in-law of World War II Veterans and a member of the House Veterans’ Affairs Committee, I take my commitment to serving those who have served us very seriously, and I will continue to look for opportunities to make real progress for our nation’s veterans. You can watch my remarks at our joint hearing of the House and Senate Veterans’ Affairs Committees with the American Legion HERE. Yesterday, I met with educators, administrators and students at Plymouth State University’s Center for Young Children and Families (CYCF) to discuss the center’s early learning STEM instruction initiatives and my legislation, the Early STEM Achievement Act, which would help support early childhood STEM programs like those at Plymouth State. In our 21st century economy, the demand for jobs in the fields of science, technology, engineering and mathematics is only increasing, and we need to ensure future generations are prepared to take on these jobs. 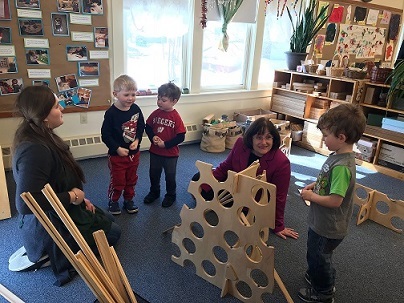 Plymouth State’s Center for Young Children and Families knows firsthand that simple, age-appropriate activities, like building a tower or bridge of blocks or playing at a water table, can help encourage interest in STEM at a young age. I appreciated hearing from leaders in this important field at Plymouth State and I will share their ideas and feedback with my colleagues as we keep working to ensure hands-on learning for our future workforce and economy. Yesterday also marked the beginning of Women’s History Month, when we recognize the incredible contributions of countless women to our nation. New Hampshire is lucky to have a rich tradition of strong women leaders and trailblazers, such as Christa McAuliffe, who taught at Concord High School and was set to be the first teacher in space on the Challenger mission in 1986. Though her life was tragically cut short, Christa continues to inspire countless young people to dream big and reach for the stars. You can learn more about Christa and her legacy here: http://christa.org/christa-corrigan-mcauliffe/. As your Representative, my main responsibility is to serve you. I encourage you to call my Concord office at 603-226-1002 with any questions, comments or ideas you may have. Thank you for making the Granite State such a wonderful place to call home, and I hope you enjoy your weekend!